While your wedding lehenga is the most important part of your ensemble, bridal jewellery comes second. Once you have decided what you are going to wear for your big day, then you have to finalise on the style of wedding jewellery you wish to wear. 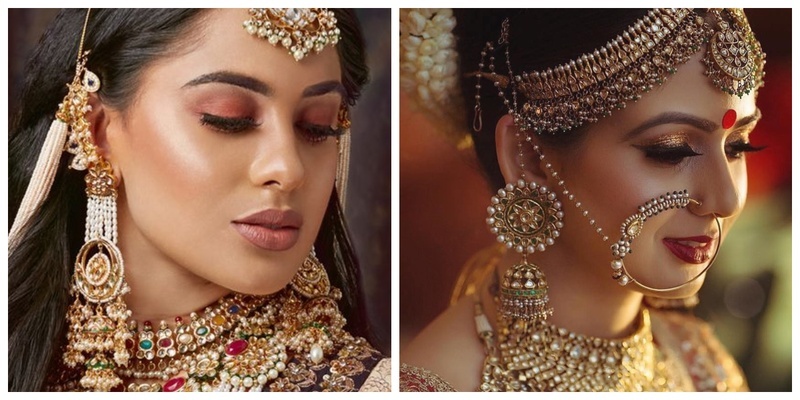 Most brides surely wear necklace and earrings with their wedding dress, and choose to opt for or leave out other accessories like matha patti, haath phool, payal etc. When it comes to bridal earrings, there are a dozen different styles you can choose from. Right from chandbali earrings to bridal jhumkis, there are a variety of bridal earring designs at your disposal. To make your wedding earring search easier, here are some of the best bridal earring designs that we spotted on real brides. Safe to say, some of these earrings never went out of style, while some have recently started trending among brides! This style of bridal earring that has a stud at the lobe and dangling jhumki is so versatile! Some of these earrings for women are design by keeping in mind style and comfort. You can detach the dangler from the stud earrings and wear the stud by itself too. Such a win-win for wearing to post-wedding functions too! For the gold lovers out there, this multi-layer gold jhumka makes for a great choice to wear with your wedding jewellery. And, if you are planning to wear a saree, then by all means go for bridal earrings like these! A beautiful pair of bridal earrings, this one can be worn for your other bridal functions like haldi or mehendi! And if you choose to wear these for the main wedding, then pick something that looks heavy or can be paired with other jewellery like matha patti and nath. Btw, a total fan of how they cover your ear all the way up and give the much needed support required for long earrings. These jhumka style earrings, also popularly known as jhumar earrings are a major trend among brides these day. Pearl jhumar earrings like these ones are highly liked and preferred by brides who want to go easy on the necklace and heavy on the earrings. Pro tip: If you choose to wear these on your wedding, choose light jhoomar earrings, so that they are much more comfortable to wear for a long time. These oversized earrings are all you need to make a statement on your D-day. The gorgeous meenakari done on these earrings adds a pop of colour to the gold and makes it stand out ever more. Pair these bridal earrings with a matching necklace to make it a complete wedding jewellery set! Chandbali earrings are here to stay; and no, I am not complaining! Chandbalis are the most versatile earring design as they can be worn with anything from sarees and lehengas to kurtis and shararas. Plus, they come in a dozen different styles. You want chandbali gold earrings or perhaps a pair of pearl chandbali earrings? You will find literally every style of chandbali in both costume jewellery and real gold jewellery! If you are a lover of everything cute and romantic, long chain earrings are just the right choice for you. Full of tiny pearls or beaded strings that go all the way up to the hair, these gold chain earrings make for a great accessory to wear on wedding functions like mehndi or sangeet. If you want to wear this earring design on your main wedding day, then it’s best to choose a heavy kundan jhumki that’s attached with chains. All kinds of jewellery trends may come and go, but gold and pearls are always in style. These beautiful pearl accented gold jhumkis sure add lots of drama and statement to the bridal look. Plus, the matching maang tikka just brings the whole look together. You can shop earrings online like this one here! If jhumka earrings are your preferred style to wear on your wedding day, then these gold jhumkas make for a gorgeous choice! The intricate jali design with leaf motifs and oversized danglers make this jhumka design a hands-down winner. Pair it with the matching gold maang tikka and you’re good to go! Shop jhumkas online here! 9. South indian earrings in gorgeous gold! If you are planning to wear South Indian jewellery on your wedding, then temple earrings and gold jhumkas in antique finish are a great option for you. These South Indian earrings are mostly studded with green and red gemstones, which look lovely against the antique gold finish jewelry. What’s more? These temple earrings or gold jhumkas are perfect to wear with Kanjivaram or pure silk sarees! While the classic chandbali earring has a half-round shape resembling a half moon, or chaand, this bridal earring slightly modifies the round shape making the chandbali look even more beautiful. And the party of pearls and green beads at the bottom is just too pretty to handle! If you are going to wear a heavy bridal necklace with your lehenga or saree, it is best to keep the bridal earrings to minimal. These beautiful earring designs are all simple with very little dangling. These types of bridal earrings can be made or bought in various styles. They are available in everything from kundan to gold as per your taste! What seems to be like an ever-booming trend with brides, gota jewellery is the way to go for your mehndi or sangeet functions. If floral jewellery is not your thing, but you don't want to wear metal jewellery either, then this beautiful gota jewellery set is perfect for you. And these gorgeous gota jhumkas just look WOW! So, which of these latest bridal earring designs did you love the most?